A 38 North exclusive with analysis by William Mugford. 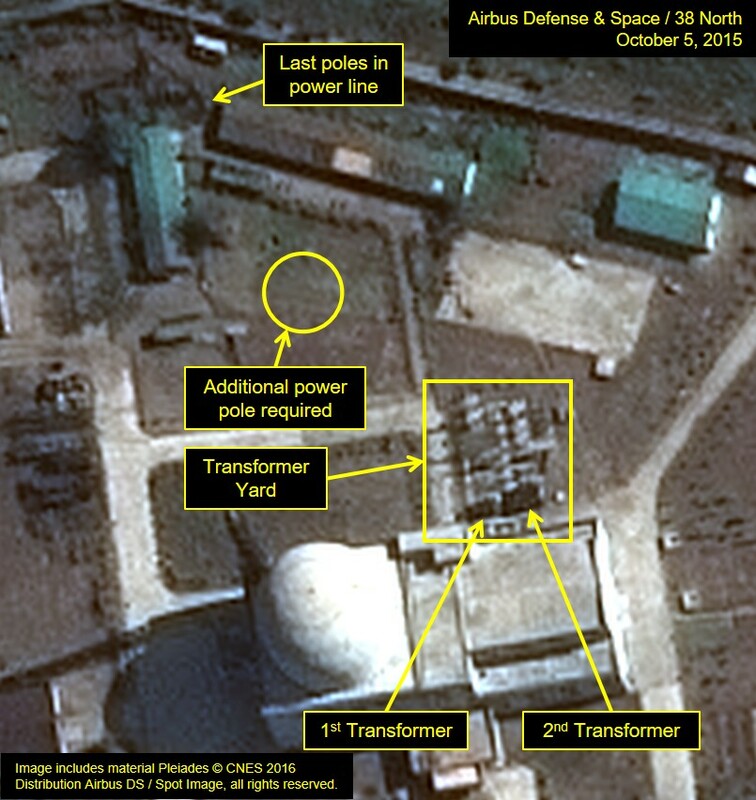 Recent commercial satellite imagery of the Yongbyon Nuclear Scientific Research Center has revealed new developments over the past six months, most recently in January 2016, suggesting that North Korea’s Experimental Light Water Reactor (ELWR) is edging closer to becoming operational. These developments are: 1) the completion of two channels that will feed water into a cistern connected to the reactor’s pump house for its cooling system; and 2) the completion of the reactor’s electric transformer yard with the installation of two new transformers. However, predicting when construction will finish and the ELWR will be become operational has proven to be difficult. 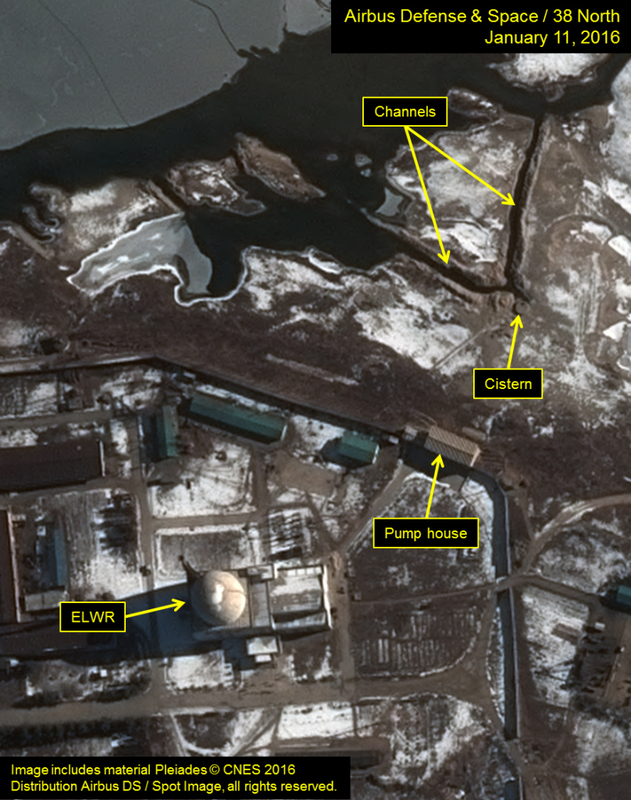 Aside from determining whether work has been finished inside the externally complete building, it still remains unclear whether the North has succeeded in fabricating the fuel assemblies necessary to power the reactor. If the ELWR becomes operational, it would be a significant development for North Korea. Aside from laying the groundwork for the construction of additional light-water reactors and providing electricity for civilian purposes, the reactor could also produce fissile material for nuclear weapons. The ELWR may also pose a safety hazard given concerns about its design and the North’s lack of experience in operating such a facility. Recent commercial satellite imagery from early January 2016 indicates that the ELWR’s cooling system has been made functional with the construction of two channels through a sand bar that allow river water to flow into a cistern critical for the operation of the reactor’s cooling system. A pump house, built in 2011-2012 and intended to provide cooling water to the reactor, located approximately 250 feet east of the southeast corner of the reactor hall on the edge of the river embankment, is connected to the reactor hall by a large underground pipe (visible in imagery from October 2012) and to the cistern that is the intake point for the cooling river water by a buried pipe. The cistern is separated from the water by as much as 250 feet of sand bar. Figure 1. Water supply channels have been constructed for the ELWR at Yongbyon. Figure 2. A 5’ diameter pipe connects the ELWR and associated pump house. In March 2014, two channels at a 90 degrees angle were excavated through the sand bar in the exposed river bottom. These channels were apparently dug to allow river water to flow to the cistern. As originally excavated in 2014, neither channel actually reached the cistern, but connected together about 20 feet away. High water in July 2014 brought the river water temporarily to the height of the cistern, but the rapidly flowing floodwaters destroyed the channels. Imagery of Yongbyon from December 29, 2015, revealed that the channels had been re-excavated, and a 20 foot extension from the apex connects the channels to the cistern. While these channels will require additional work to be considered permanent, this may be the first time that cooling water has been available to the reactor on a permanent basis. Since operation of the reactor prior to the completion of a permanent water supply is not possible, this development may suggest that the ELWR is closer to becoming operational. 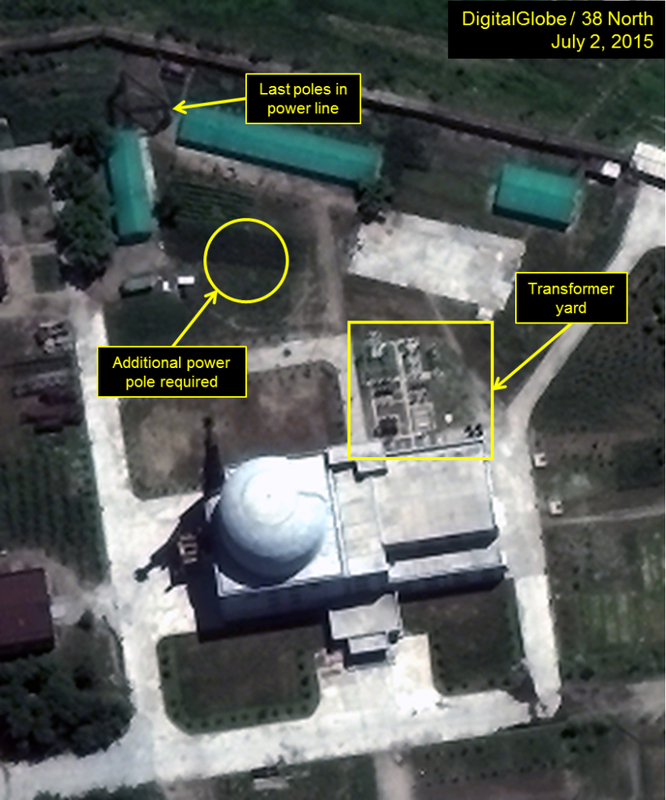 Imagery from September 2012 to October 2015 shows continued slow progress towards the completion of the reactor’s transformer yard. (An electrical substation with transformers and switches to direct and control the reactor-produced power into the attached power lines, a transformer yard is a necessary part of every power producing (or power using) system.) When first observed in September 2012, the yard consisted of foundation excavations. Work on power line towers and switch stanchions that occupy the outer (eastern) section of the yard was completed within a year. Installation of probable transformers, located in the western section adjacent to the reactor hall, took more time, perhaps because they had to be ordered and delivered. The first transformer was installed in July 2015 and the second, nearly twice as large as the other one, in October 2015, completing the yard. Figure 3. The ELWR’s transformer yard and power line positions. Figure 4. A second transformer was installed at the ELWR’s transformer yard. Pyongyang has yet to connect the transformer yard to the electrical grid, a final step—outside completing work on the reactor itself—needed for the facility to become operational. Power lines that service facilities along the river, including the adjacent 5 MWe plutonium production reactor, extend from the north down the riverside of the 5 MWe reactor area and stop in the northeast corner of the ELWR facility. The distance from the last set of power poles in the ELWR’s northeast corner to the power line towers on the east side of the transformer yard is approximately 225 feet. The distance between the power poles that service the area is approximately 159 feet, which indicates that at least one set of poles will have to be erected between the yard and the existing poles in the NE corner. There is significant “activity” in this area, but not anything that can be positively identified as a power pole. Since hooking up the power line will not require major construction, it could happen quickly and at any time. Predicting when the ELWR will become operational has been difficult. External work on the reactor was completed in October 2015 when the transformer yard was completed; however, it appears that the North has continued work inside the new facility. 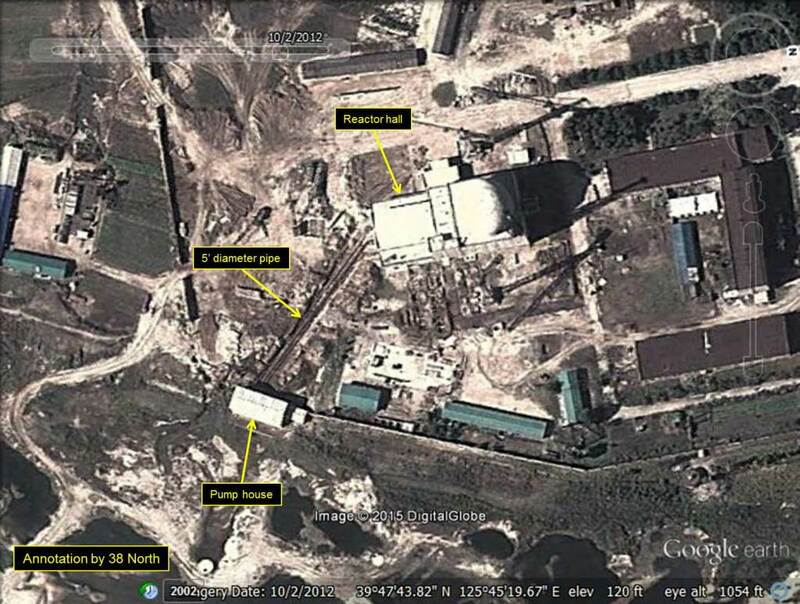 Moreover, while the North has stated that low enriched uranium (LEU) is being produced to fuel the reactor, it remains unclear whether and when Pyongyang can fabricate the necessary fuel assemblies for the ELWR, a technically challenging task. The recent activities discussed in the preceding paragraphs, may suggest that the reactor is approaching an operational status, but do not answer the North’s problems producing the fuel for the ELWR. If the ELWR becomes operational, it would be a significant development. Aside from laying the groundwork for the construction of additional light-water reactors and providing electricity for civilian purposes, the reactor could also produce fissile material for nuclear weapons. The ELWR may also pose a safety hazard given the North’s lack of experience in operating such a facility and concerns about its design.